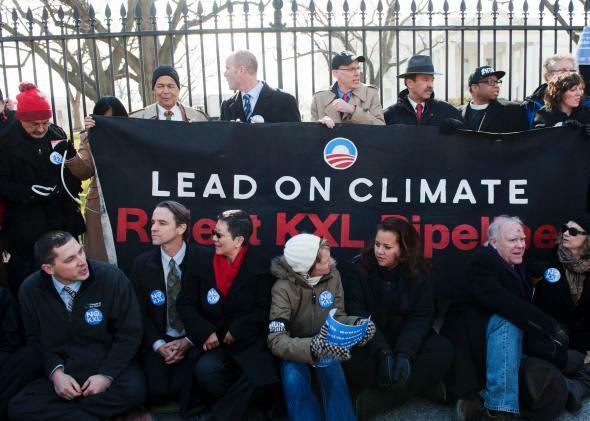 AFL-CIO and Keystone: Why labor likes pipelines. Labor says not so much. This has some people surprised on the grounds that the project is set to create very few permanent jobs. The issue here, however, is all about the building trades unions. The building trades have been backing Keystone for a long time because from the viewpoint of a construction worker all jobs are temporary jobs. Actually building the pipeline will involve thousands of construction workers. The larger union federation had been staying studiously “neutral” out of concern for larger issues of coalition politics, alliance with the environmental movement, etc. But there’s no big countervailing forces inside the labor federation against the building trades’ interest in the pipeline. The State Department’s recent report that gave a favorable verdict to the pipeline changes the calculation in terms of the bigger coalition. If the State Department is giving it a thumbs up, then for all the unions that don’t care it’s not clear what’s gained by neutrality. And for the building trades the upside of building the pipeline remains what it ever was—construction jobs. * Correction: An earlier version of this article mistook a new article based around some remarks that AFL-CIO chief Richard Trumka made in January for an article about new remarks from Trumka.